Sophomores Timothy Benac of Cobleskill Richmondville, center, and Lars White of Catskill, right present their project to SUNY Polytechnic Institute Nanoengineering Professor Pradeep Haldar. The 10th grade chemistry class recently hosted a trade show so students could present their alternative energy projects to SUNY Polytechnic Institute scientists, professors and graduate students. The project put students into the roles of marketing sales representatives who had to promote energy products with interactive displays. They had to explain scientific concepts behind the modules, which ranged from batteries and solar cells to biofuels. Students had an authentic audience for the event. The professors and scientists who attended the show are representatives of E2TAC, an energy group on campus. According to its website, E2TAC offers a platform for SUNY Polytechnic Institute to integrate nanoelectronics and nanotechnology in advanced energy and environmental applications. 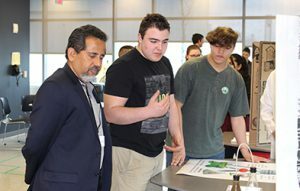 “This was a great opportunity for students to demonstrate their work and the knowledge they transmitted through hands-on experiments,” SUNY Polytechnic Institute Nanotechnology Professor Pradeep Haldar said. “What I like most is the students’ excitement about their projects,” research scientist and SUNY Poly adjunct faculty member Manisha Rane-Fondacaro said.